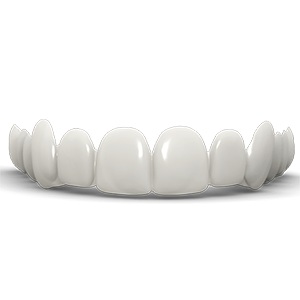 Veneers are ultra-thin sculpted pieces of tooth-shaped porcelain that fit over the front of your teeth. They are wonderful for fixing teeth that are significantly discolored, chipped, pitted, malformed, or crooked, or if you have unwanted spaces. In certain situations, a change in upper lip fullness and balance can be obtained by placing porcelain laminate veneers on your four front teeth. Most often we will need to recontour your teeth slightly.. Usually a small amount of tooth is removed so that when the porcelain is applied over your teeth, the end result will be a seamless transition from tooth to porcelain. The photograph above shows a porcelain veneer in front of a prepared tooth. 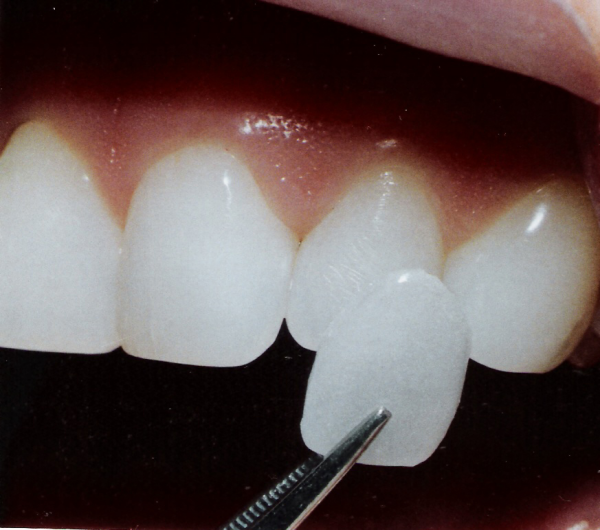 Notice how thin the porcelain veneer is--0.5 millimeter thick. It is similar to the thickness of a fingernail. 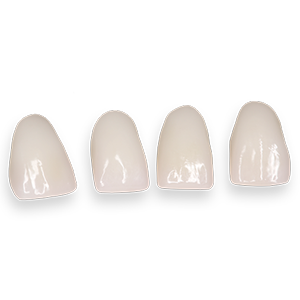 Unlike crowns or caps, porcelain laminate veneers don't require the removal of much tooth structure. Veneers are usually created in a dental laboratory from an impression taken in the dental office. During the first visit, the color is matched using a shade guide then the teeth are gentle prepared. Next the teeth are fitted with temporaries while the veneers are being created at the lab. Then the veneers are cemented directly onto your teeth and polished to a natural, aesthetic smile. Veneers are stronger and have a longer life than bonding, but the process requires more time. Veneers typically cost less than crowns and won't stain, making them a popular means of improving your smile. Treatment may take two or more office visits to complete and will last for up to 15 years. We know you will absolutely love your new smile! Usually a small amount of tooth is removed so that when the porcelain is applied over your teeth, the end result will be a seamless transition from tooth to porcelain. The doctor will take an impression that will be used by a laboratory to fabricate your veneers. It takes about two weeks for them to be made. During that time, you will be wearing plastic, temporary veneers that will be removed and discarded when you return. The doctor will permanently bond your new veneers onto your teeth. When the application process is complete the veneers will be seamlessly shaped and their appearance will be almost undetectable.